So, Mo sent me a little something. 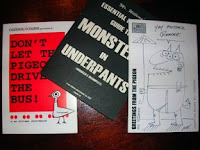 Signed sketchbooks  including the famous Pigeon one  and an original Monster in Underpants picture! It’s a perfect way to introduce my interview with the man himself. On this site is one part, a little teaser. At The Edge of the Forest, you’ll find the rest of the interview, along with other reviews, articles, and features. 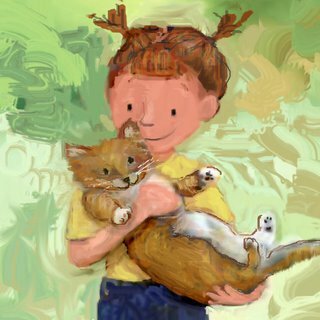 Teaser question: How did the sketchbooks get started? Who do they go to? And how, exactly, did the Pigeon go from being the sketchbook to a picture book? That’s three teaser questions and consequentially requires dull exposition about the early 1990s. Being dissolute, my friend quickly ran out of stuff to fill his ’Zine,3 so I suggested hijacking one issue with New Yorker-style cartoons that I’d doodled over the previous year. 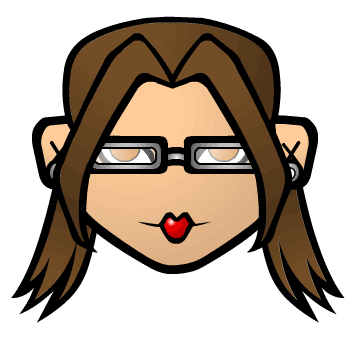 Some of the books are collections of cartoons, others short stories, or more serious illustration. Essentially, the sketchbooks are an outlet for me to play and experiment with things that otherwise no one in their right minds would publish. This January I shipped out my 14th edition of the Mo Willems Sketchbook, entitled Mr. Willems’ Essential Reference Guide to MONSTERS IN UNDERPANTS [Abridged and Incomplete]. It is, as you might guess, a guide to various Monsters and their undergarments. The most “famous” of these sketchbooks, I suppose, is the original version of Don’t Let the Pigeon Drive the Bus!, which fell into the hands of an agent who was amused, who in turn showed it to multiple publishers, who were not. Hilarious! Yay for Mo-Reader, and yay for Mo Willems! Cool stuff and and interview! This must be a dream come true for you! This is great! I am so jealous of you being buddies with the Pigeon man! Willems is a speaker at Texas Library Association in April. I cannot wait to hear him! Excellent interview. Awesome. And, I think LW is right on, MR. You should be MoReader from here on out. Very cool sketchbooks. Thanks for showing them to us!! How close is the pigeon sketchbook to the final pigeon book? "Buddies" may be a strong term for it. It's more like I fawn over him and he occasionally throws me tidbits in the hopes that I'll stop ringing his doorbell and hiding in the hedges. The final pigeon book is really close to the sketchbook. Far more so than I ever guessed. Some panels were combined into that two-page spread with eight panels. A few reasons are changed. But it's very close. Very nice to hear the whole story. How I'd love to see one of those sketchbooks. Nice interview. Glad to see Mo is funny and deserving of your fawning, MR!! Just one question, perhaps for your NEXT interview with Mr Willems (1)... is he related to Terry Pratchett (King of the footnote.)? 1) I wanted to call him Mr Mo, but even though I feel I know him through you I thought it might be perceived as 'too familiar' or impolite.